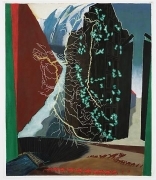 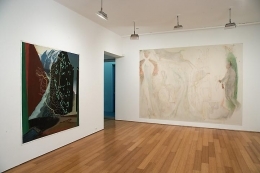 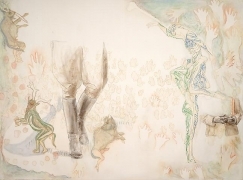 In her exhibition at Alexander Gray Associates, Jo Baer presented four large-scale works, which she has referred to as “image constellations.” These paintings, shown for the first time in the United States, incorporate imagery drawn from a range of historical, mythological, cultural and natural sources. 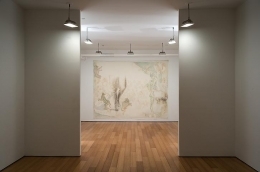 Two paintings from the early 1990s, are epic in scale, with a soft palate of beiges and browns, with delicate ghosted drawn lines that appear fluid, through a deft application of paint. 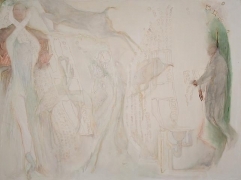 At the Back of the North Wind (1990) arranges maps and cave drawing-like patterns with ballerinas, gazelles, and a hanging man; Of A Fearful Symmetry (1991) also includes transmutations of humans and animals, a soldier’s boots, and dancers. 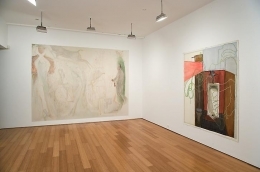 Paintings from the early 2000s are bolder in their visual impact, with deeper colors and architectural presence. 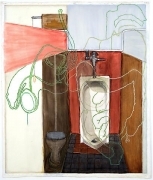 The content of the paintings are associative and layered; in Testament to the Powers that Be (2001), topographical maps intersect with mountain ranges and details of the Hoover Dam; in Shrine of the Piggies (2001), outlines of male reproductive organs are overlayed on the interior view of a men’s bathroom.